File this under the something you don’t see everyday department – here’s a baby weasel riding a woodpecker as photographed in Hornchurch Country Park in London, England. You’d be tempted to say this was all Photoshop, but nope this is real. Amateur photographer, Martin Le-May, caught the moment during a walk in the park. 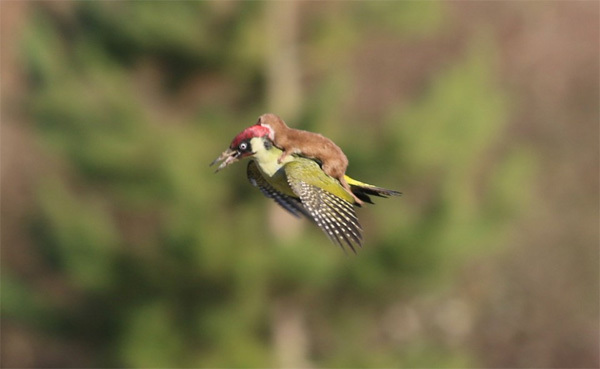 Apparently the weasel was trying to attack the woodpecker, not hitch a ride. Here is the tale as he described it to BuzzFeed News. “As we walked we heard a distressed squawking and I saw that flash of green. So hurriedly I pointed out to Ann the bird and it settled into the grass behind a couple of small silver birch trees. Both of us trained our binoculars and it occurred that the woodpecker was unnaturally hopping about like it was treading on a hot surface. Lots of wing flapping showing that gloriously yellow/white colour interspersed with the flash of red head feathers. Just after I switched from my binoculars to my camera the bird flew across us and slightly in our direction; suddenly it was obvious it had a small mammal on its back and this was a struggle for life. The woodpecker landed in front of us and I feared the worst. I guess though our presence, maybe 25 meters away, momentarily distracted the weasel. The woodpecker seized the opportunity and flew up and away into some bushes away to our left. Quickly the bird gathered its self respect and flew up into the trees and away from our sight.